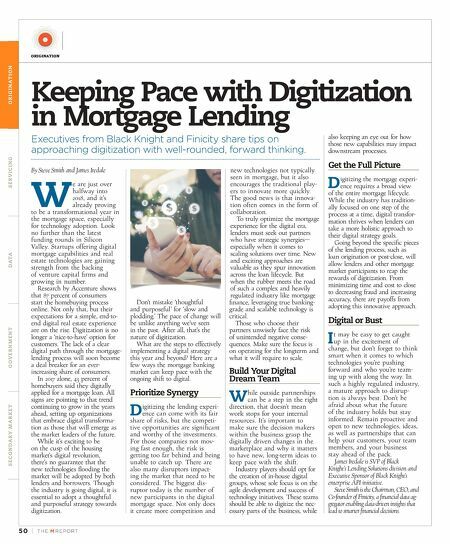 50 | TH E M R EP O RT O R I G I NAT I O N S E R V I C I N G DATA G O V E R N M E N T S E C O N DA R Y M A R K E T ORIGINATION Keeping Pace with Digitization in Mortgage Lending Executives from Black Knight and Finicity share tips on approaching digitization with well-rounded, forward thinking. By Steve Smith and James Iredale W e are just over halfway into 2018, and it's already proving to be a transformational year in the mortgage space, especially for technology adoption. Look no further than the latest funding rounds in Silicon Valley. Startups offering digital mortgage capabilities and real estate technologies are gaining strength from the backing of venture capital firms and growing in number. Research by Accenture shows that 87 percent of consumers start the homebuying process online. Not only that, but their expectations for a simple, end-to- end digital real estate experience are on the rise. Digitization is no longer a 'nice-to-have' option for customers. The lack of a clear digital path through the mortgage- lending process will soon become a deal breaker for an ever- increasing share of consumers. In 2017 alone, 43 percent of homebuyers said they digitally applied for a mortgage loan. All signs are pointing to that trend continuing to grow in the years ahead, setting up organizations that embrace digital transforma- tion as those that will emerge as the market leaders of the future. While it's exciting to be on the cusp of the housing market's digital revolution, there's no guarantee that the new technologies flooding the market will be adopted by both lenders and borrowers. Though the industry is going digital, it is essential to adopt a thoughtful and purposeful strategy towards digitization. Don't mistake 'thoughtful and purposeful' for 'slow and plodding.' The pace of change will be unlike anything we've seen in the past. After all, that's the nature of digitization. What are the steps to effectively implementing a digital strategy this year and beyond? Here are a few ways the mortgage banking market can keep pace with the ongoing shift to digital. Prioritize Synergy D igitizing the lending experi- ence can come with its fair share of risks, but the competi- tive opportunities are significant and worthy of the investments. 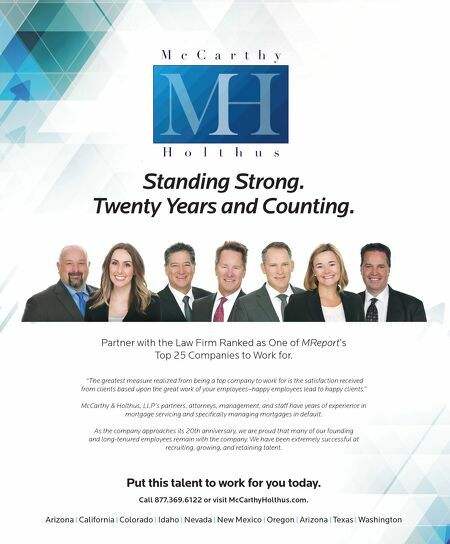 For those companies not mov- ing fast enough, the risk is getting too far behind and being unable to catch up. There are also many disruptors impact- ing the market that need to be considered. The biggest dis- ruptor today is the number of new participants in the digital mortgage space. Not only does it create more competition and new technologies not typically seen in mortgage, but it also encourages the traditional play- ers to innovate more quickly. The good news is that innova- tion often comes in the form of collaboration. To truly optimize the mortgage experience for the digital era, lenders must seek out partners who have strategic synergies— especially when it comes to scaling solutions over time. New and exciting approaches are valuable as they spur innovation across the loan lifecycle. But when the rubber meets the road of such a complex and heavily regulated industry like mortgage finance, leveraging true banking- grade and scalable technology is critical. Those who choose their partners unwisely face the risk of unintended negative conse- quences. Make sure the focus is on operating for the longterm and what it will require to scale. Build Your Digital Dream Team W hile outside partnerships can be a step in the right direction, that doesn't mean work stops for your internal resources. It's important to make sure the decision makers within the business grasp the digitally driven changes in the marketplace and why it matters to have new, long-term ideas to keep pace with the shift. Industry players should opt for the creation of in-house digital groups, whose sole focus is on the agile development and success of technology initiatives. These teams should be able to digitize the nec- essary parts of the business, while also keeping an eye out for how those new capabilities may impact downstream processes. Get the Full Picture D igitizing the mortgage experi- ence requires a broad view of the entire mortgage lifecycle. While the industry has tradition- ally focused on one step of the process at a time, digital transfor- mation thrives when lenders can take a more holistic approach to their digital strategy goals. Going beyond the specific pieces of the lending process, such as loan origination or post-close, will allow lenders and other mortgage market participants to reap the rewards of digitization. From minimizing time and cost to close to decreasing fraud and increasing accuracy, there are payoffs from adopting this innovative approach. Digital or Bust I t may be easy to get caught up in the excitement of change, but don't forget to think smart when it comes to which technologies you're pushing forward and who you're team- ing up with along the way. In such a highly regulated industry, a mature approach to disrup- tion is always best. Don't be afraid about what the future of the industry holds but stay informed. Remain proactive and open to new technologies, ideas, as well as partnerships that can help your customers, your team members, and your business stay ahead of the pack. James Iredale is SVP of Black Knight's Lending Solutions division and Executive Sponsor of Black Knight's enterprise API initiative. Steve Smith is the Chairman, CEO, and Co-founder of Finicity, a financial data ag- gregator enabling data-driven insights that lead to smarter financial decisions.